1 of 3 Heat oven to 350 degrees F. Coat 2 baking sheets with nonstick cooking spray. Whisk flour, baking powder, baking soda and salt together; set aside. 2 of 3 Beat butter and granulated sugar together until blended. Add egg, ricotta and vanilla, beating until combined. 3 of 3 On low speed, add flour mixture and beat until blended. Drop by tablespoonfuls onto prepared pans. Bake at 350 degrees F for 14 minutes or until lightly browned around edges. Let cool on sheets 3 minutes, then remove to rack to cool completely. 1 of 1 Beat confectioners sugar and milk together until well blended. 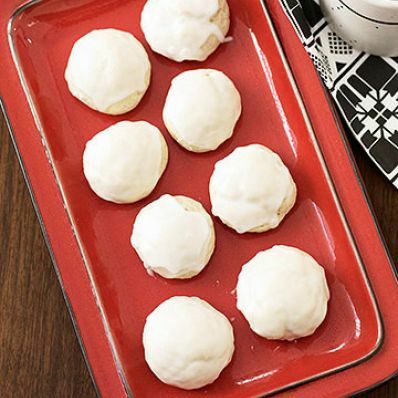 Dip tops of cookies into glaze and set aside until glaze has hardened.